Stainless Steel Sauté Pan Before I got a sauté pan I never thought it was an essential. But it’s truly a workhorse in my kitchen. I use it to deep fry, I use it to braise, I use it to stir fry, heck, I even use it to make sauces. I love the fact that the straight sides make it difficult for me to splash things out of the pan – which makes it an excellent choice for me since I tend to be a little bit messy in the kitchen. 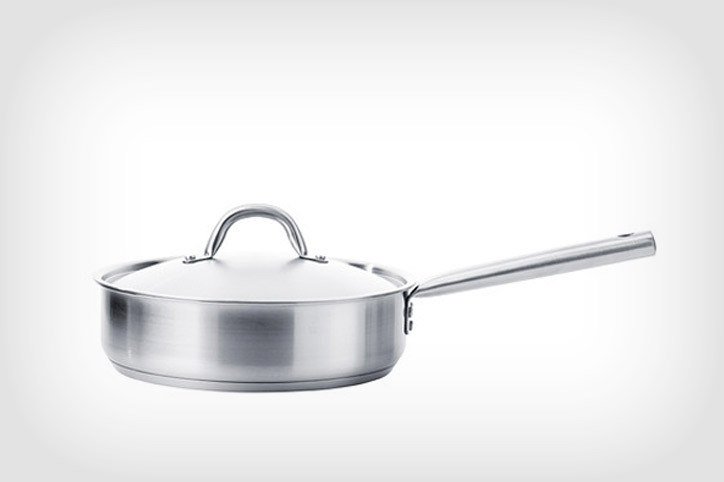 If I had to choose between a sauté pan and a regular skillet, I would probably choose a sauté pan. Just like frying pans, you can pretty much cook anything in them. They’re great for deglazing, especially with acidic liquids, since they are non-reactive. When you’re choosing sauté pans and skillets, I’d say the most important thing to think about is the weight. Sturdy bottoms promote even heating. Right now my sauté pan is Ikea 365+ which totally does the job, but if I were to invest in a lifetime piece, I’d probably buy myself this All-Clad. Nonstick Skillet If you ever check out my Instagram account, you know that I eat a lot of eggs. And eggs are just so much more easy to cook in non-stick. I also use non-sticks when I’m making delicate things that are prone to sticking, like fish. Aside from eggs, I don’t use them much, so they’re not something I spend a lot of money on. But, I did splurge once and buy myself a panda pan – it makes my mornings that much more panda-ful. Wok I use my carbon steel wok when I want to fry rice or noodles. I also use it when I’m deep frying and steaming. A wok may seem like a waste of space and if you don’t make Asian food, it might be, but being Chinese, I just wouldn’t feel right without a wok. 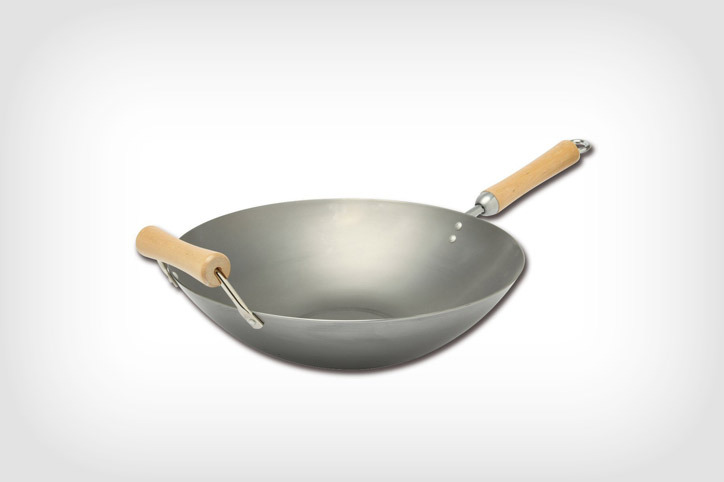 My wok is carbon steel – it heats evenly and quickly. Sauce Pan I use sauce pans all the time – to boil eggs (I eat a lot of them), to blanch vegetables, to cook grains and yes, even to make sauces. A good stainless steel sauce pan is super versatile – I even use them to deep fry. 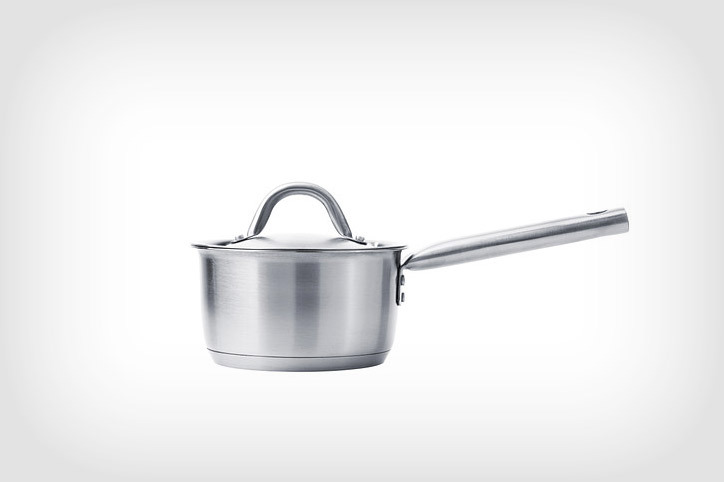 Just like my sauté and sauce pans, I’m using Ikea 365+, but one day I’ll get myself a set of All-Clad. Stock Pots If you’re going to be making pasta or soup, you’re going to need a stock pot. I have several in various sizes, all stainless steel and all from Ikea. They’re affordable, they have a relatively thick base, they have measures on the side, and they’re oven and dish washer safe. Simple and easy. 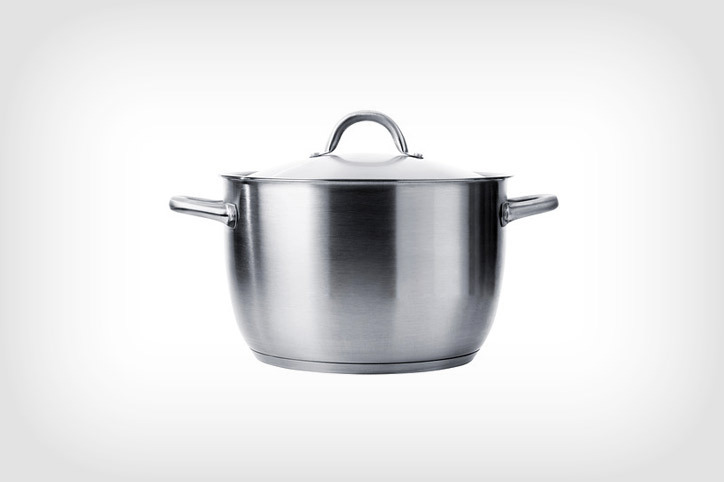 Compared to sauté pans and skillets, you don’t have to worry as much about the quality of your pots – they usually have a pretty easy job where they just hang out and simmer. Milk Pan I bought this milk pan when I was in Japan based on its looks alone. But now I find myself reaching for it more and more. It’s great for heating up small amounts of liquid (the pouring spout is a nice feature) and I love using it to make sauces or gravies. It’s basically a tiny enamel covered sauce pan. And those are my pots and pans! I’d have to say that my favourite is the panda pan – just because I love eggs and pandas. What do you guys use in the kitchen? Any favourite brands? What a great post! I love the I’m a traveller so I can never really invest in pots and pans – too heavy – but we did buy a beautiful cast iron pan for our travels around Australia. Campfire cooking, anyone! That milk pan is too cute!! ooh campfire cooking is the BEST! OMG, I love, love, love this post. Thanks for sharing! I love that you use a lot of pans from Ikea 365+ too; makes me feel less self-conscious about my non-All Clad/Le Creuset collection of random pots and pans in my kitchen. I want that panda skillet! So so so so cute! That milk pan too is gorgeous. I’ve started shifting to stainless steel myself these past few years. They are so easy to maintain! My brand so far is Cuisinart since I can’t afford the expensive stuff. 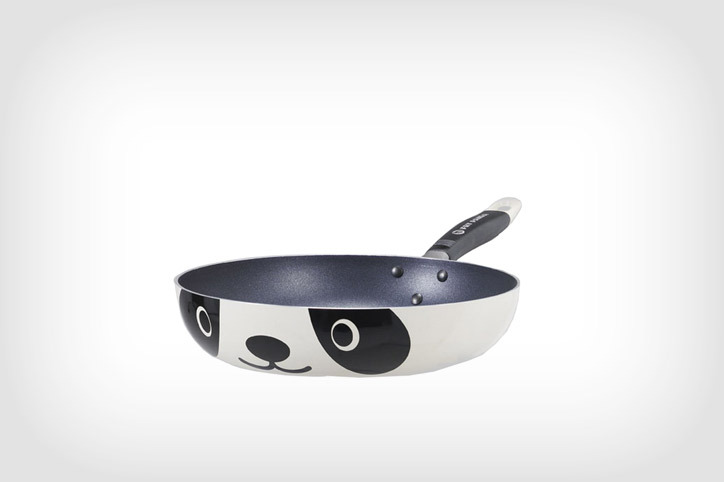 Seriously in love with that panda skillet. How do you maintain it’s white bottom from burn marks? Love the non stick skillet!!!! I am totally with you on all of these pots and pans. i would add a dutch oven to the list though. it is a must have in my kitchen not only to make the perfect roast or stew but also for baking my breads in. ooh a dutch oven!! that’s an excellent one. i really should invest in one of those! That panda pan is awesome. I love pots and pans, thanks for sharing what you use! I got myself one of the Lodge Logic carbon steel pans http://www.lodgemfg.com/seasoned-carbon-steel/seasoned-steel-griddle-11. I am obsessed with it! It’s a little less heavy and weighty than my cast iron, but will last forever and is super-non stick from the get-go! I can throw in an egg to fry, walk away and come back and lift it off the pan with just a fork or spoon. It’s a thing of beauty, Stephanie! Crepes too! Thanks for a great list! It’s nice to see other cooks out there that don’t have all the most-expensive gear. Ikea ftw! ooh that griddle sounds intriguing, especially since it’s not so weighty! thanks for the suggestion sophie! Thanks for sharing! It’s great to see what you use to cook such tasty food! I absolutely absolutely ADORE this post, Steph! Thank you so much for putting it together. For one, my mom has a milk pan and I’ve been wondering where to get one myself for years but I never knew what it was called (d’oh!) so I’m super excited to start hunting! (She scored a whole set of enamel cookware at a yard sale a few years back … so lucky.) 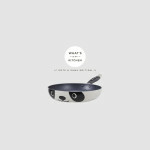 And obviously you know I feel you on that gorgeous wok and anything cast-iron <3 Plus the PANDA PAN I'M DYING. OK bottom line, I could live in your kitchen. The end. Hi Cynthia — just wanted to add, the “milk pan” is similar to a butter warmer, another search term you can use in your hunt! 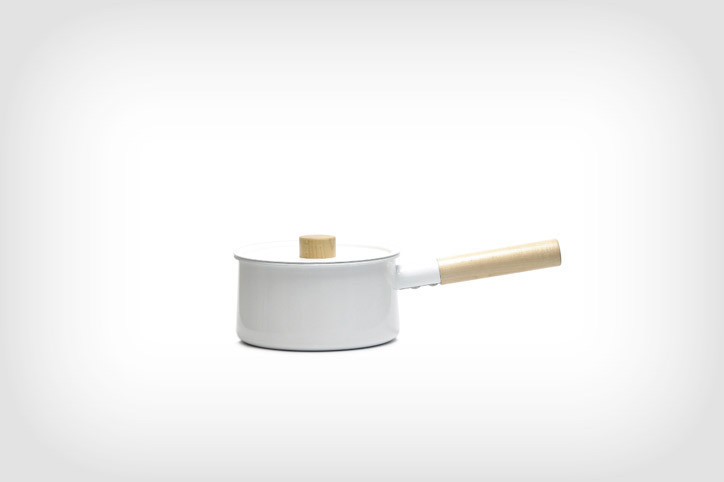 The ones from the Dansk Kobenstyle line are so cute, one of these days I’m going to snag one . . . I looove this post. The panda pan is so freaking cute. And I agree with you on the small saucepan—I use mine constantly! It’s one of my most used pans, for sure.